A timeless paradise, a dream place ... Villa Margherita, a house surrounded by nature and immersed in the Mediterranean scrub, is the right choice for a perfect holiday! The villa is located a few kilometers from the Natural Reserve of the Foce del Fiume Platani, so that from the pool area you can enjoy a wonderful view right on the reserve. The house is well finished in every detail, the simple furniture blends harmoniously with a unique architecture that makes it particular and characteristic. Comfortable, bright, spacious, it is equipped with every comfort that will make your stay unforgettable. You will find in fact free WiFi, air conditioning, washing machine and private parking in the shade. It consists of 4 comfortable rooms and a sofa bed for 2 people in the attic, for a total of 10 sleepings; of 3 bathrooms; of a well-equipped kitchen and of a large living room that overlooks 2 beautiful verandas. One of them enjoys a relaxing view of the blue Mediterranean sea. The outdoor is definitely the strong point of the property, provided with several spaces that can be experienced in the total comfort: there are a barbecue corner with outdoor kitchen, a further bathroom adjacent to this area and an outdoor shower with hot water. Villa Margherita is the ideal place for those who want to explore the unspoiled places of Sicily and enjoy the quiet sound of the surrounding nature, far from everyday life! This is a truly beautiful house. 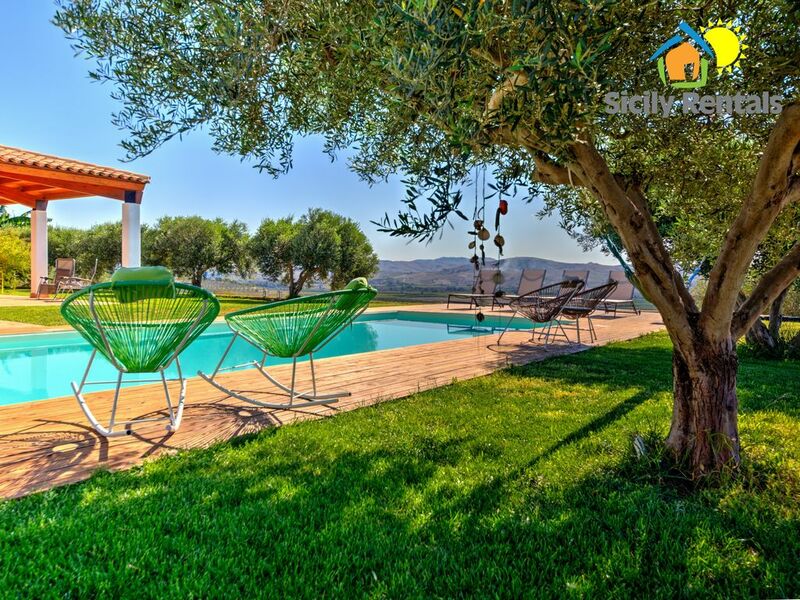 Set in a quiet and peaceful location with lovely views, the property has been expertly designed to reflect various historical cultural influences in Sicily, including Arabic and Spanish. The ornamental detail is particularly special. Inside, the house is light and spacious with modern appliances and fittings. It is spotlessly clean. Wi-fi is fast and reliable. The kitchen is very well equipped. If you enjoy cooking, you will not be disappointed - everything you need to prepare meals is readily available. The outdoor area has an abundance of spaces and facilities for relaxing, allowing you to sit or lie in the sun or shade throughout the entire day. The owners, Margherita and Peppe, could not have done more to ensure that we enjoyed our stay. They are very friendly, helpful and generous hosts. The vegetable garden was at our disposal, and we were privileged to enjoy the last of the oranges that grow, as well as Margherita's home-made orange preserve and orange honey. We had a fabulous holiday in this property and were very sorry to leave. Bilder sagen mehr als 1000 Worte. Das stimmt hier zu 100%. Die Villa ist sehr sauber und mit viel Geschmack eingerichtet. Wer die Ruhe liebt ist hier genau am richtigen Platz. Alles vorhanden was benötigt wird um einen schönen Urlaub zu verbringen. Eine sehr hilfsbereite Gastgerberin. Verena ist zu jederzeit für einem da und steht einem mit Rat und Tat zur Seite. Wir haben uns rundum wohl gefühlt und können diese Villa nur weiter empfehlen. Struttura super e proprietari altrettanti... disponibili, gentili e soprattutto ospitali!!! Consigliatissima!!! Wunderschönes Haus in herrlicher Umgebung.Haus ist geschmackvoll eingerichtet und sehr gemütlich. Küche überkomplett ausgestattet. In dem Haus ist alles vorhanden was man braucht. Betten wunderbar. Fliegengitter in den wichtigsten Räumen vorhanden, im Wohnzimmer leider nicht . Klima sowohl zum kühlen als auch zum heizen. Besitzer besonders freundlich und zuvorkommend . Wir haben uns über das Willkommenspaket sehr gefreut. Auf der Terrasse des Hauses hat man einen Blick über die ganze Gegend bis zum Meer. Rundherum nur Obst und Gemüseanbau. Meer in ein paar Minuten erreichbar. Herrliche unberührte Strände. Für einen entspannenden Urlaub besonders geeignet. Das Haus kann man 100%IG empfehlen. Schön wäre noch, wenn ein Pool vorhanden wäre. Ausgrabungen in Selinunte und Agrigento innerhalb 1 Stunde erreichbar. Einkaufen :10 km in Ribera . Außergewöhnlich schön, außergewöhnlich sauber, außergewöhnlich freundlich! Molto bella , molto pulita, molto ospitale! Affitando la villa Margherita non si può sbagliare, non dimenticate di visitare la spiaggia di Torre Salsa e concedetevi un menù al "Capitolo Primo Del Relais Briuccia" in Montallegro! Villa Margherita is located in Ribera, a village known as “City of orange” for its international oranges production all over Europe. The pleasant summer nights are livened up by culinary feasts, music entertainments, cultural festivals and a lot of other events. Moreover, the town has recently got the acknowledgement of “City slow”, thanks to its care in improving citizens’ and guests’ wellness. Ribera boasts marvellous beaches: “Borgo Bonsignore” is a famous beach area thanks to its uncontaminated coasts and to the natural reserve of “Foce del fiume Platani”. “Piana Grande” is a sandy and pebbled beach where admiring the typical Mediterranean vegetation; it is a really loved place from young people, since the seafront is crowded of people who go there to enjoy themselves in the summer nights. “Secca Grande”, the most renowned beach place of Ribera, is the ideal place for those who love both the uncontaminated beaches and the amusement, since it is full of bars, clubs, restaurants and there are a lot of cultural events and entertainments at nights. Ribera also offers several sights such as Francesco Crispi’s native house, Duke of Bivona’s palace, Poggiodiana castle and a lot of interesting churches. “Foce del Fiume Platani”: a protected area between Borgo Bonsignore and Capo Bianco, whose calcareous cliffs rise up marking the landscape incomparably. This area is characterized by sandy dunes, mouth zones, hill landscapes and Mediterranean wood that blend harmoniously each other. “Torre Salsa”: a natural masterpiece protected by WWF, located between Siculiana Marina and Eraclea Minoa. Its peculiarity are the chalk and clay cliffs and the very bright sea, whose bottom is marked by a rich blooming flora and fauna. The six kilometres of wild nature encompass jagged shores, golden and secluded beaches, sandy dunes and uncontaminated paths which will fascinate sea and nature lovers. The Valley of the Temples is one of the most suggestive attraction of Sicily. It rises in the southern part of the old city and is considered the biggest archaeological park in the world. Among a blooming almond trees countryside, the wonderful ruins of the temples, whose architectural majesty is still intact, will fascinate you. This archaeological marvel consists of eight temples built in the 5th century BC: the Temple of Hera, the Temple of Concordia, the Temple of Heracles, the Temple of Olympian Zeus, the Temple of Castor and Pollux, the Temple of Hephaestos, the Temple of Demeter, and the Temple of Asclepius (the God of Medicine). The last one is situated on the banks of the Akragas river, all the others are in the same area on a rocky scarp in the southern modern Agrigento. The Valley of the Temples is the most sublime evidence of the Greek civilization in Sicily until today and it has been an Unesco world heritage site since 1998. It is a real singular white cliff made by limestone and clay which rises along the coast of Realmonte and overlooks a crystalline sea. Its name comes from the Turkish invasions, since the legend says that Saracens got there from the sea and climbed the cliff to reach the near villages and attacked them. It has became a tourist attraction for its particular colour and shape; wind and rain have modelled it throughout the time, creating a huge natural staircase whose lines are rounded and irregular. Its white rocks look brighter thanks to the sun light and the water is incredibly clear.. it’s a paradise! The villa will offer you this and a lot more. You will experience the emotion of a special vacation combining the typical rustic quietness, magic landscapes, sea and natural paradises but also marvellous cultural routes. Per prenotare la casa è richiesto il versamento del 50% della tariffa di affitto tramite bonifico bancario o carta di credito. Il saldo, insieme al deposito cauzionale, sarà versato il giorno dell'arrivo. N.B. I prezzi settimanali mostrati nel sito includono le spese di pulizie finali, tariffa unica per la durata del soggiorno e non settimanale.